November 18, 2013 /0 Comments/in Diabetes /by Jenn F.
You may not have heard of it, but osteomyelitis is one of the most frequent foot infections in diabetics, accounting for 10-15% of mild infections and nearly 50% of severe infections. 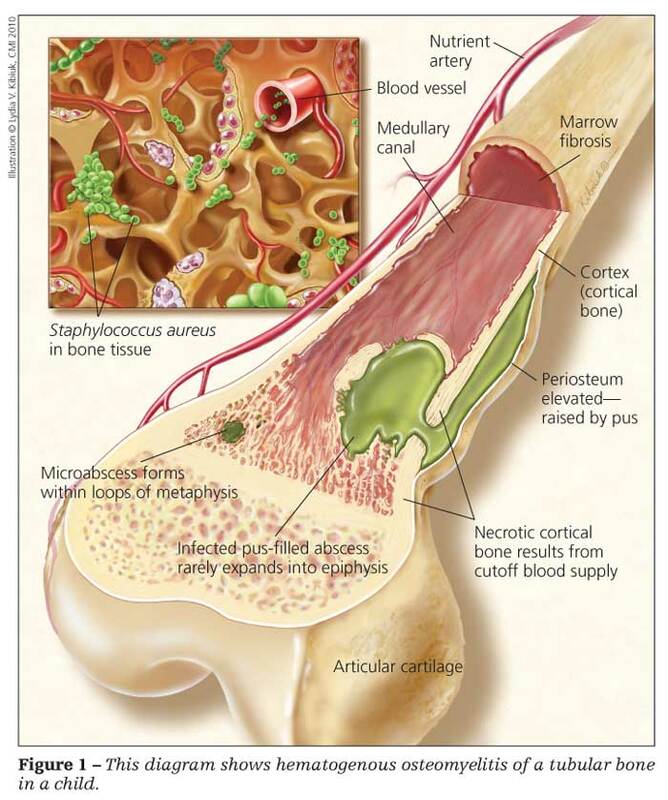 Osteomyelitis is an infection of the bone that is caused by a variety of microbes — most notably staphylococcus aureus. This infection affects roughly two out of every 10,000 people, according to The Cleveland Clinic, and is especially prevalent among diabetics, sickle cell anemics, dialysis patients, drug users, the elderly, and people with weakened immune systems. Early symptoms include pain, tenderness, swelling, warmth, and fever. Many people become nauseous, uneasy, and generally ill-feeling. Sometimes pus drainage through the skin is visible. Excessive sweating, chills, swelling of the lower extremities, and limping have also been reported alongside osteomyelitis. A diagnosis can be made by a physician who will look for signs of tenderness and likely order blood tests/cultures. Other diagnostic indicators include needle aspiration, biopsies, and bone scans. Until fairly recently, the standard treatment for diabetic foot osteomyelitis was to scrape away infected portions of the bone during the open surgical procedure. However, more doctors are using antibiotics as a first course treatment to cause remission. The antibiotics rid the body of harmful bacteria in the bloodstream that may otherwise re-infect the bone. Aspiration (draining of infection using a needle) and biopsy sampling will ensure you are given the proper type and dose of antibiotics. Splinting or casting may be required to immobilize the infected bone and avoid further injury. In some cases, surgery is still required, but the prognosis is very good when using a combination of surgery and antibiotics. Very rare cases of chronic osteomyelitis may lead to foot amputation or squamous-cell skin cancer. Though rare, prompt medical attention is important when diabetics encounter any signs or symptoms of infection. SteriShoe is a must-have device recommended by podiatrists to limit your contact with harmful bacteria and pathogens. While most of us wash our feet daily and throw our socks through the wash, our footwear often gets neglected. The built-up bacteria festers and thrives for months, easily infiltrating socks where it can come into contact with a small cut or blister to enter the body. We can’t promise that you will never get a foot infection, but we can say that clinical studies show our germicidal UVC light kills up to 99.9% of all bacteria, fungus, and microbes in the shoe within 45 minutes — and that you are substantially reducing your risk of developing a bacterial infection by using our product. Buy Sterishoe now! Waiting For Toenail Fungus To Grow Out: Can You Make Your Nails Grow Faster?